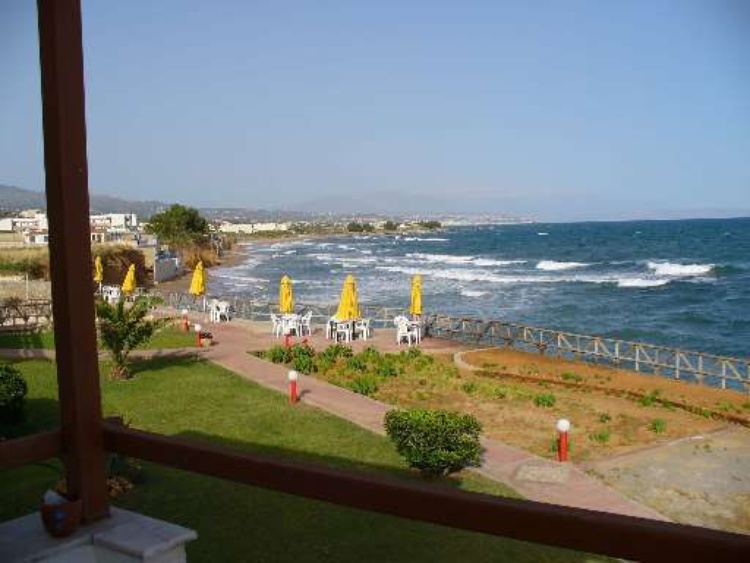 Our view is going over the bay of Rethymnon to the old town, Cape Drapanon, Akrotiri peninsula to the mountain range of the White Mountains. 74150, Europe, Greece, Crete, Rethymnon ,Sfakaki Stavromenos Rethymnon. 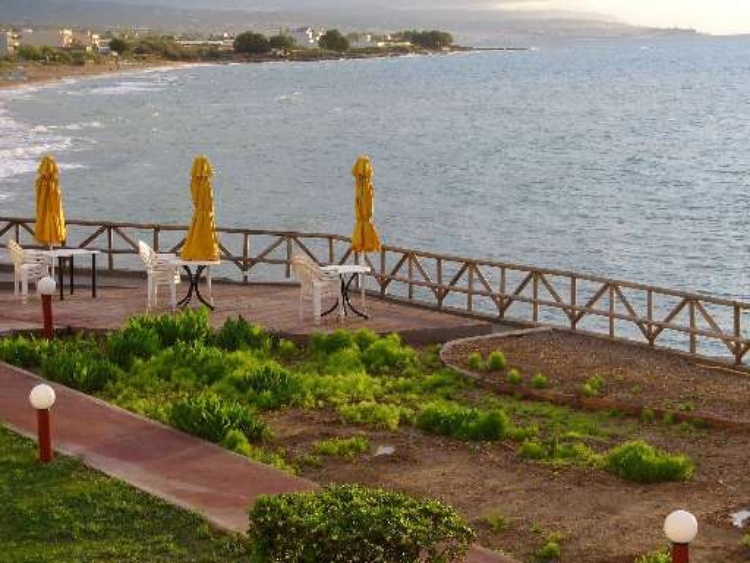 Several houses on a 6.000 m/2 ground with STUDIOS, HOLIDAYAPARTMENTS and 1 FLAT , 80 with 100 m/2 terrace at the sea, sweet water pool,breakfast room + a large breakfast terrace straight at the beach , snack bar, a small childrens playing ground and parking are available. 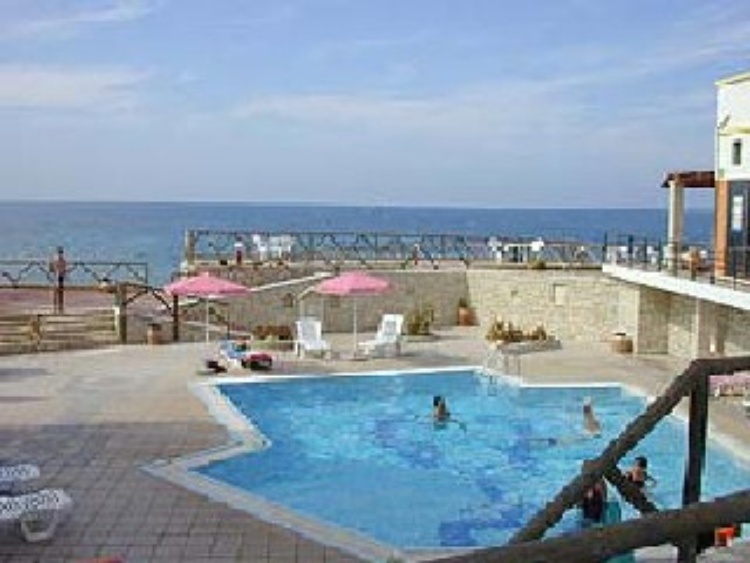 In RECEPTION AREA there is a PC with INTERNETCONNECTION available ( free ) and WLAN connection for your laptop is in most holidayapartments out of charge possible. 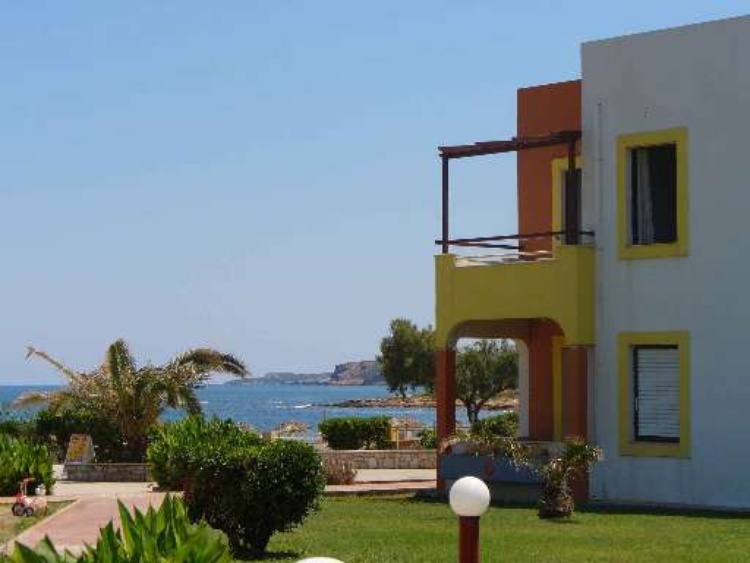 In a distance of maximum 500 m you will find 5 typical familytaverns, baker, doctor, farmacy, small shops, 2 supermarkets, a petrol station and the bus stop with a lot of connections to RETHYMNON town, 12 km distance. 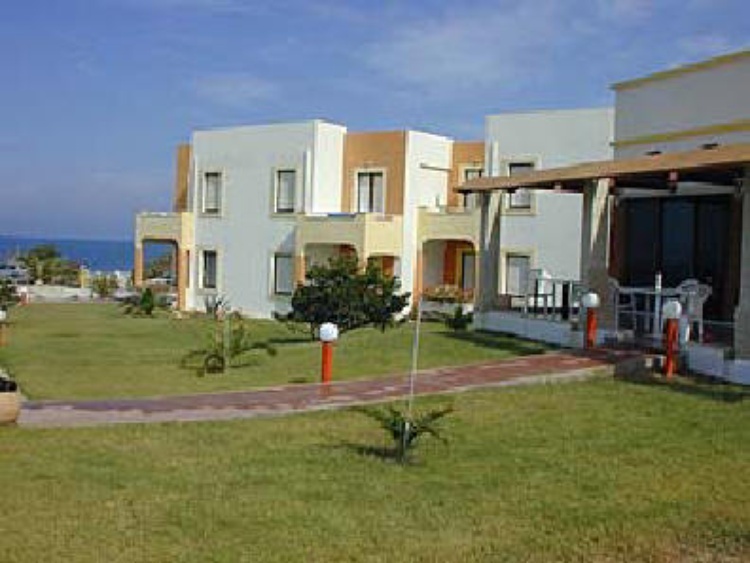 TYPE B: apartments for up to 4 people, 40 m / 2.1 bedroom with double bed (200 x 190), 2 additional beds separately in the living area, here is also the dining area, the kitchenette, refrigerator, ceramic hob, microwave, extractor hood , sink, dishes and cutlery, pots, pans, etc., bathroom / WC, TV, air conditioning + safe (fee), balcony with sea view. 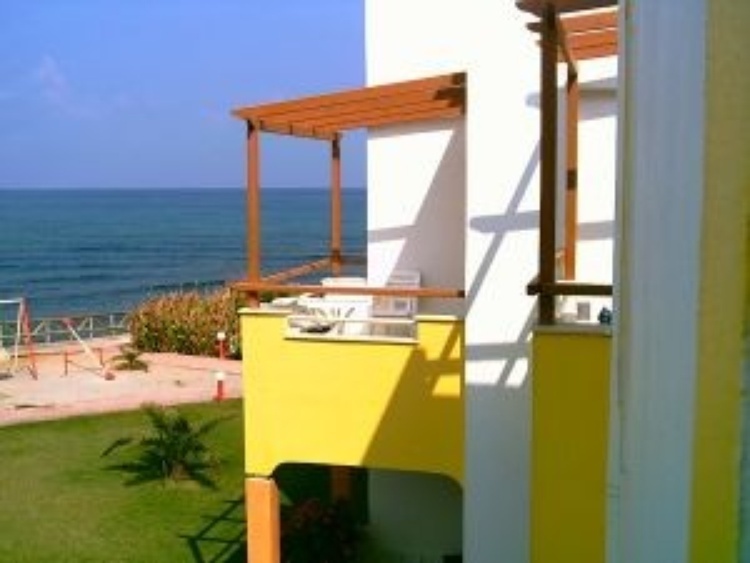 RATES are valid according desired apartment type, the exact date + the number of guests per unit + include linen (1 x weekly), towels 2 x per week (not for pool or beach), electricity, water, cleaning (3 times a week ) & final cleaning. The minimum rental period is 1 week !!! 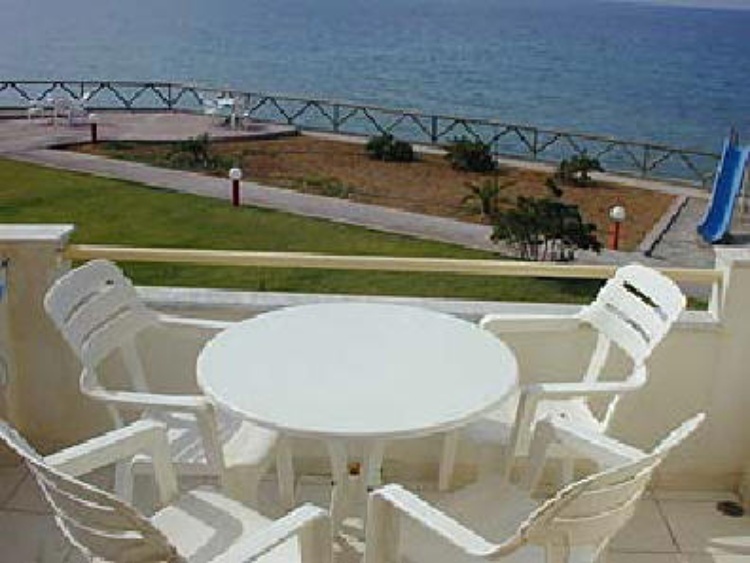 TYPE C: family suite with sea view : 1 large flat on the 1st floor for up to 7 people, 80 m / 2, with 2 bedrooms for 4 persons + 3 additional beds in the large living area, a kitchenette with a refrigerator freezer , keran field with 4 hot plates, extractor hood, microwave, dishwasher, cutlery, crockery, coffee maker, pots, etc., washing machine, iron + board, 2 bathrooms Flat-screen TV, , air conditioning in both bedrooms (charge), safe for a fee, 3 balconies + a 100m / 2 large terrace facing the sea with sun loungers and parasols. (If you need 3 bedrooms, so we have next door the only other apartment on the same floor with 1 separate bedroom). 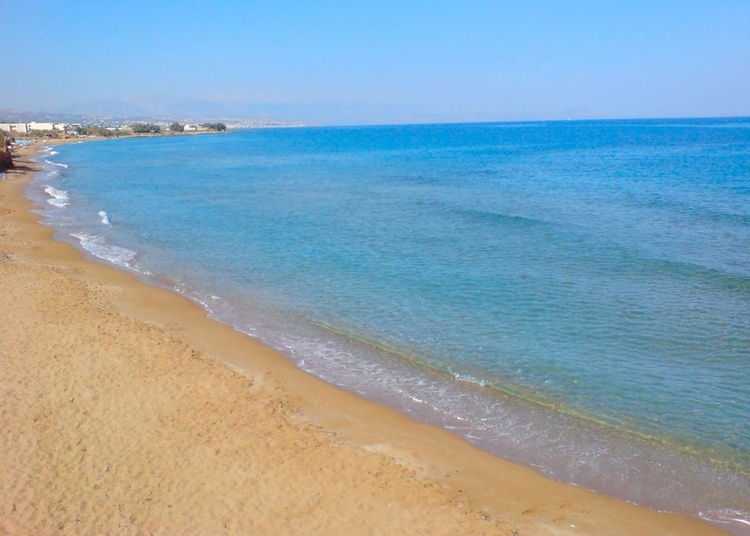 Northcoast of Crete, SFAKAKI,which has been former called Stavromenos,straight at the sandy beach and NOT in an busy tourism area there is situated the family run B & B Hotel/Apartments ,at the beach of CRISI AMO = Golden Sand.